Stop the presses. 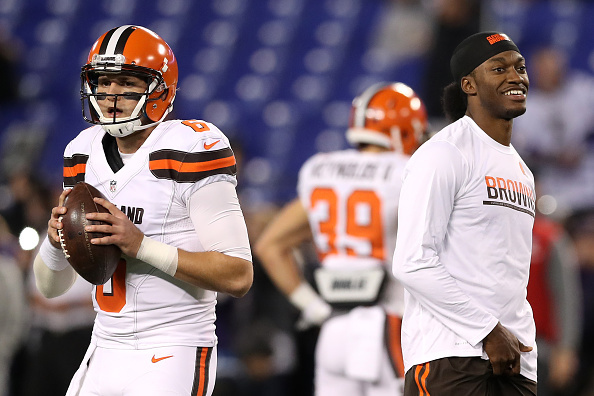 We’ve got a quarterback update in Cleveland, one which could keep the revolving door at that position spinning away. Word is Robert Griffin III has been cleared for non-contact practice after healing from a broken bone in his shoulder. For those who forgot – and it wouldn’t be a surprise if you did – Griffin won the starting job for the Cleveland Browns in training camp. He survived one game before his trademark durability issues struck, and he’s been sidelined ever since. After Griffin went down, Cleveland cycled through five different quarterbacks, finally landing on rookie Cody Kessler. Though the former USC Trojan has performed admirably this year, he was inexplicably yanked by coach Hue Jackson in the team’s most recent defeat to the Baltimore Ravens. So, while the initial thought upon hearing Griffin is one step closer to being game ready would understandably be “who cares,” there’s reason to think otherwise. In fact, it’s easy to see how this latest update could make the Browns’ ever-changing quarterback situation cloudier than ever. To kick it off, let’s revisit how things currently look for Kessler, the rookie Jackson told everyone to trust. As mentioned, Kessler was doing just fine in Cleveland’s game against the Ravens. However, despite only being down six points, Jackson benched him in favor of Josh McCown, who quickly turned into an uncontrollable dumpster fire on the field. After the game, Jackson said Kessler would start this week against the Pittsburgh Steelers, but rebuked a reporter when it was suggested he was the team’s starter for the rest of the season. After Jackson gave Kessler the glowing endorsement of “I’m going to see Cody for the rest of this season as much as I deem necessary,” you can see how the rookie may be on a surprisingly short leash. Who’s to say he won’t be yanked again if Jackson is once again unimpressed this weekend? It’s tough to see a situation where Kessler keeps being pulled while still getting the starting nod every week. Because of this, Griffin’s clearance to practice definitely shifts a lot in Cleveland. It may sound crazy on the surface, but if I were a betting man, I’d put money down on Griffin making a return for the Browns this season. The reasons for this are pretty simple. One, Cleveland’s offensive line is as strong as wet toilet paper, so even if Kessler stays in, the odds of him getting hurt (for the third time this season) are high. Two, when you recall how much time and effort Jackson put in preparing Griffin this offseason, it’d actually be more of a surprise if the quarterback didn’t take the field again this year. Remember, Griffin was the priority project for Cleveland’s coach. Hell-bent on rejuvenating a seemingly broken career, Jackson was determined to make the 2012 Rookie of the Year a quality starter again. Having this plan get cut short in Week 1 was unfortunate for him, and I’d be surprised if he’d turn down the chance to give it one last go this season. It goes without saying this scenario isn’t exactly ideal for a team constantly looking for a quarterback. Cleveland simply hasn’t seen enough from Kessler to determine whether or not it needs to take a QB with its first round pick next spring. Cutting his season short to reinsert Griffin into the starting job won’t help that cause. Additionally, in Griffin’s short time on the field this year, we saw the same issues he displayed during his four years in Washington. An inability to stay healthy, consistent struggles at going through progressions, difficulty reading a defense. It was all there for everyone to see in Week 1. Are we to believe these red flags have improved during his time on the sideline? It’s tough to believe that’s the case, just as it’s difficult to see the benefits of benching Kessler to give Griffin another look. But, these are Browns we’re talking about. When’s the last time this team did anything right at quarterback? Handing the reins back to a QB who doesn’t seem to have it anymore and taking them away from a rookie the team is still trying to evaluate? That’s just par for the course in Cleveland.